Yassss! 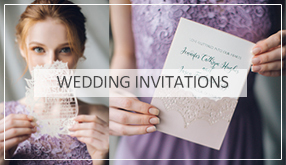 Personally so in love with the simple chic and rustic weddings!If you also feel like the “going back to the origins” style and celebrate your wedding in a traditional style,the country wedding idea is definitely your perfect choice. 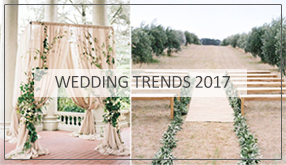 Wine barrel,hay bales, wood pallets, mason jars, burlap and lace, cowboy boots, tree stump and etc, individual or combined, will help to highlight your wedding. Now let’s learn how to nail the theme. 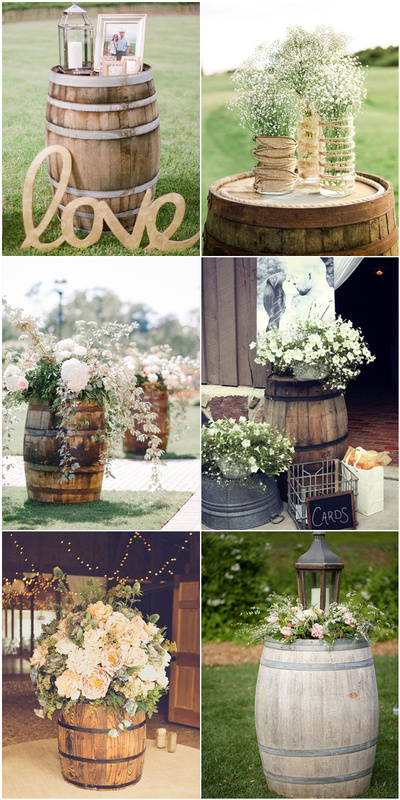 Wooden barrels are wonderful for vineyard and country style weddings. 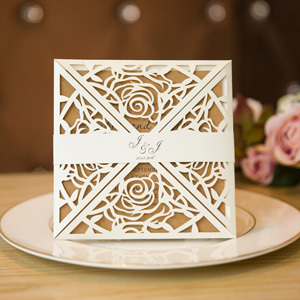 It is a great idea for flower displays, can be the perfect support for your wedding cake, and used as tables for an outdoor relax area. 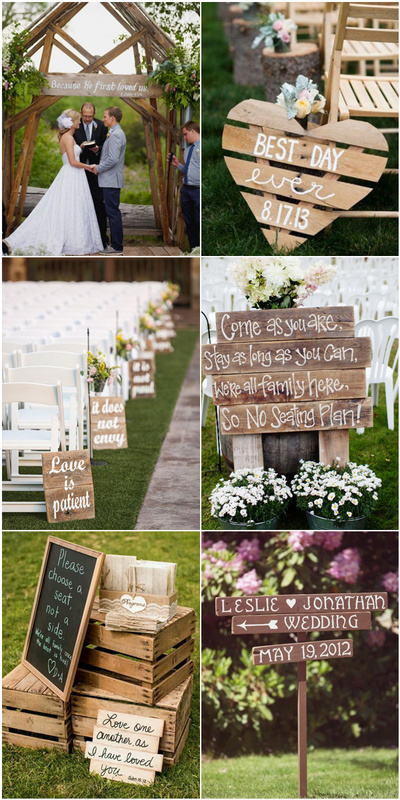 Hay bale is an eco and budget friendly element to well decorate your dream outdoor weddings. They are natural and in good height of seating. 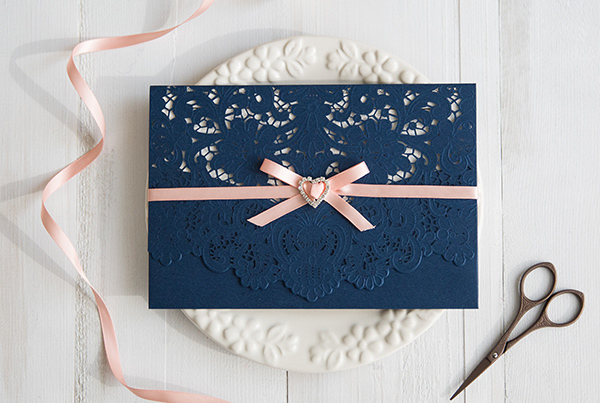 Also,you can dress them up to match your wedding colors. 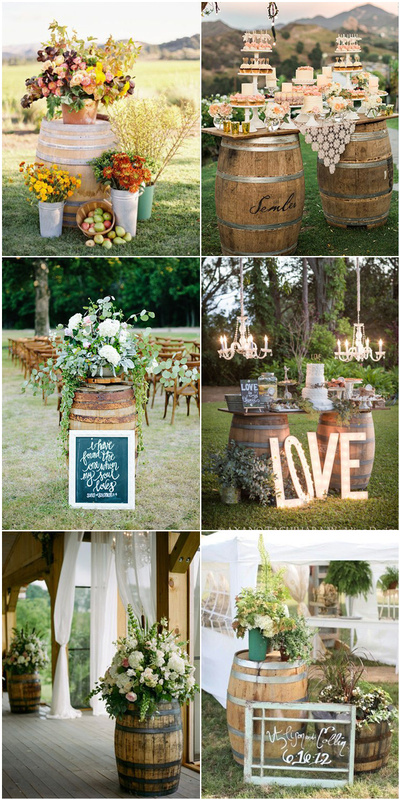 Using the tree stumps is a fabulous wedding decor idea for couples who are budget. But believe or not, the tree stumps are very functional and look incrediable with alomost any color. 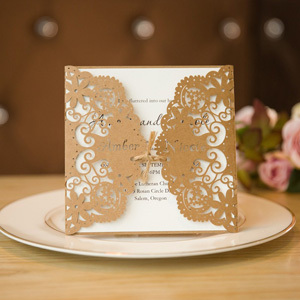 You can use them as extra seat, as cake or dessert stands or create centerpieces. 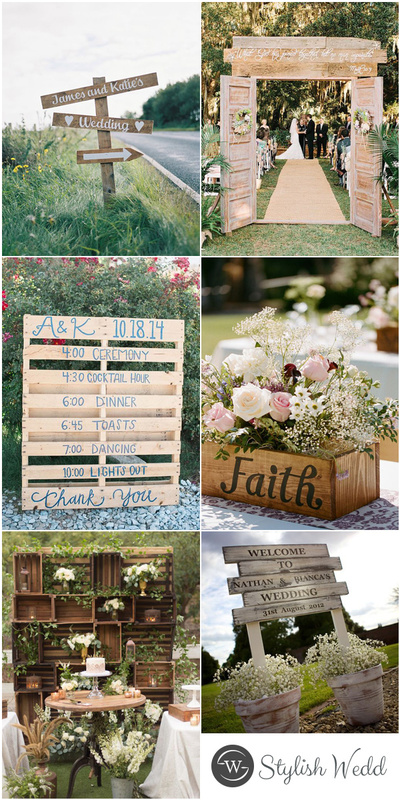 Whether you opt for a rustic or rough country wedding, wood pallets can find their unique way to create an eye-caching look for your wedding. 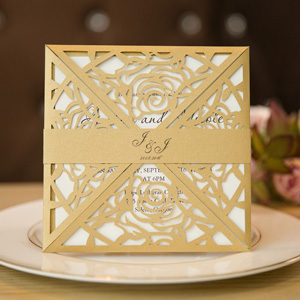 You can use it as seating chart, personalized pallet art, guest book, programme sign, ceremony backdrop as well as wedding table plan. Do you have a love of cowboy boots and cowboy hats and all things western related? 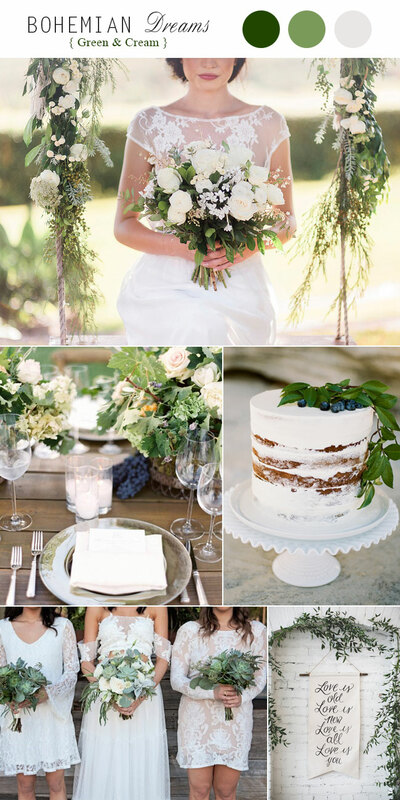 The cowboy inspired watern wedding ideas won’t disappoint you! 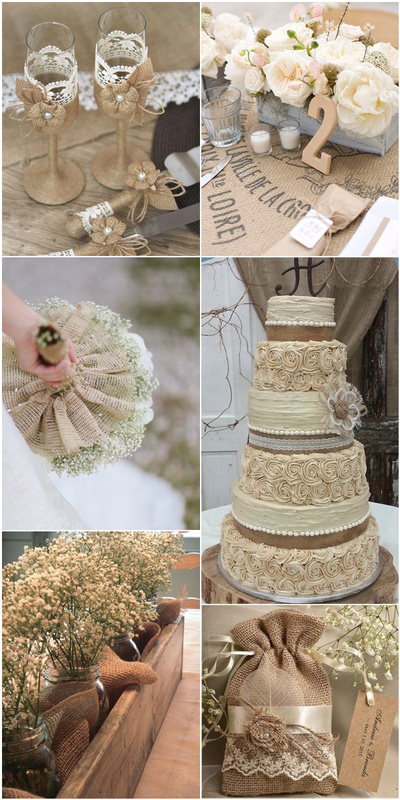 Burlap is always known as the mark of rustic wedding elements. 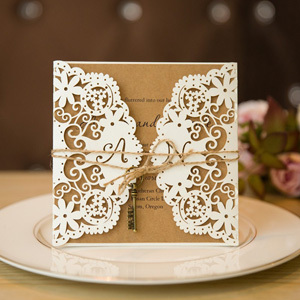 Combined with the lace, it can transform your wedding into a wondrous and fabulous place. Incorporating the Mason Jars with some burlap and lace, or, just filling it with sand and candles, or flowers, you can easily create a rustic themed event.